Since I have challenged myself to cook down the pantry this month I had to get creative in order to satisfy the craving for Mexican food. Which meant instead of opening up a package of store bought flour tortillas (which I usually have on hand) I had to make them from scratch since we were all out of tortillas. Nothing to stress about though flour tortillas are pretty basic. All you need is flour, baking powder, a little salt, some fat (butter, oil, or lard), and milk or water. I used my handy-dandy tortilla press but you could just as easily roll them out with a rolling pin. 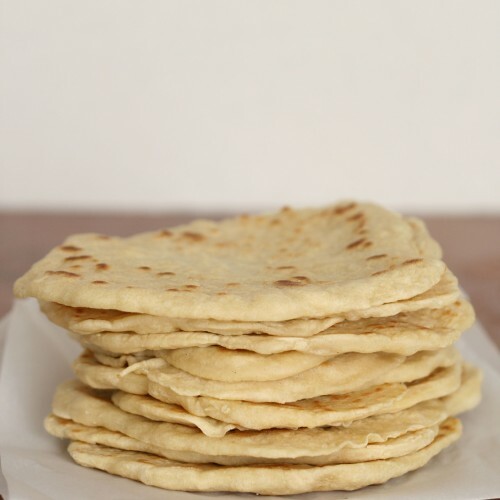 In just over 30 minutes you will taste your first warm homemade tortilla. Warm and fluffy with a slight chewiness to them, they are delicious. You will probably be tempted to drizzle them in honey and sprinkle on some cinnamon and sugar instead of using them for dinner. Don’t say I didn’t warn you! If you manage to not eat them all by the time you are done cooking them I recommend using them to make chicken enchilada casserole. I did in fact manage to have eleven tortillas leftover when I was finished cooking, so those eleven homemade tortillas were used in Chicken Enchilada Casserole or you may prefer to call it Mexican Lasagna. 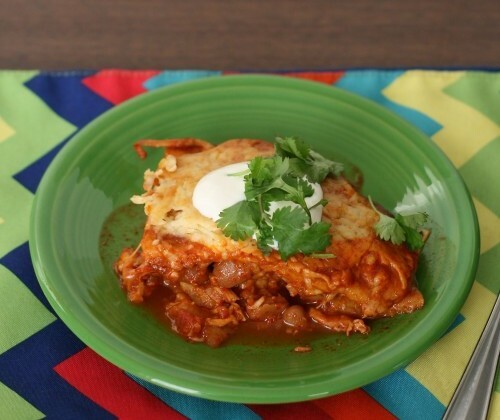 This Mexican Lasagna/Casserole uses flour tortillas in place of the lasagna noodles. Reflecting back on the first time I made this dish was with my sister Katie. She came to visit me in my first crappy college apartment. I am pretty sure the plans for the evening included beer drinking and what pairs better with beer than spicy Mexican food. 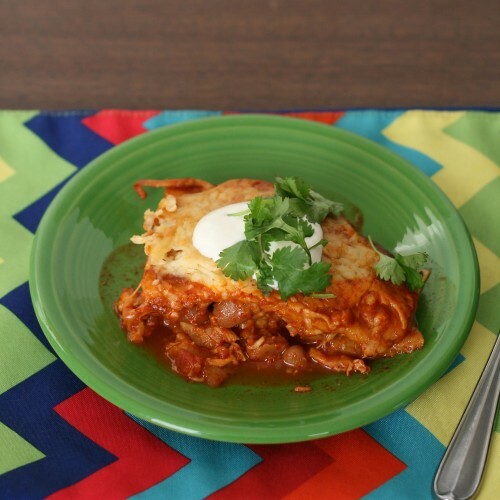 If my memory serves me correctly we initially had planned on making chicken enchiladas that night. We had the chicken cooked and all the ingredients ready to go when one of us (I’m going to take credit) decided it would be quicker just to layer everything like a lasagna instead of rolling enchiladas. This was probably 10 years ago pre-Pinterest, pre-food blog culture, and pre-Facebook. Needless to say this was a major hit with my beer drinking friends 10 years ago and a major hit with my adorable family now. In a large bowl or stand mixer mix together flour, baking powder, and salt. Add the lard or butter and combine. 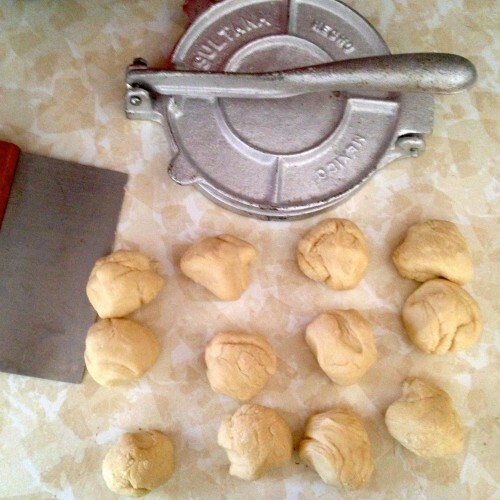 If using a mixer switch to a dough hook. On low slowly add in the warm milk or water until dough begins to pull away from the bowl. Cook for about 30 seconds per side. Transfer to plate and keep covered with a kitchen towel. Place casserole dish on a baking sheet and bake for 45 minutes. Remove from oven and allow to cool for 10-15 minutes before cutting --this allows the casserole to "set up"
What a lovely story Jamie. It’s so great to hear how this dish came about in a dorm room! I love spicy Mexican too and I wish I was that creative. Definitely going to try this lasagna with homemade tortillas (no idea they were that easy to make!!). Loving this operation empty the pantry!! I couldn’t believe how long ago it was the my sister and I came up with this. It is so much easier to layer the ingredients. Looks sooo yummy! The one time I tried to make tortillas was a fail. I should try it again 22 yrs later! You can do it Kath! Love this recipe and story, Jamie!